When we did this play therapy activity, my stress level was high because I was preparing for the CPCE. I like the fact that we were able to create our own colors instead of buying different colored frosting; it gave a sense of ownership and personalization. Our group decided to mix a set of colors that we each wanted; this allowed everyone’s desire to be honored. 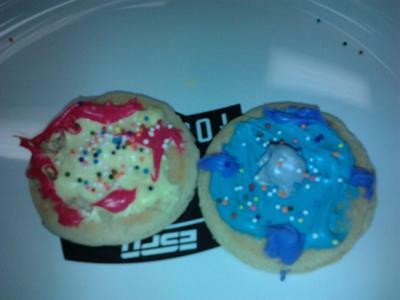 I also liked the idea that we were instructed to decorate 2 play therapy feeling cookies. Initially, I didn’t understand the reason for the extra cookie until I did the play therapy activity. My first play therapy feeling cookie represented my anxiety leading up to the CPCE; I felt grey and blue. My second play therapy cookie was the complete opposite, it was yellow and red. This play therapy cookie represented how I knew I would feel after the exam. It helped me to process the fact that the exam represented not only anxiety, but joy and the culmination of my graduate studies. If I only had the first cookie, I would be eating sad feelings, but the second cookie allowed me to each happy feelings too. Having the sprinkles was just a fun way to close. Sprinkles have such a positive connotation in our society, that it’s hard to stay sad when you have sprinkles.